Gospel Light Christian School was founded 42 years ago with the sole purpose of educating students mentally and spiritually. When a parent showed Bro. Bobby a public school text book with curse words in it, his heart was immediately burdened. One year later, August 19, 1972, Gospel Light Christian School became an envisioned reality. The school began with only six grades, but soon grew to a full K3 thru twelfth grade. 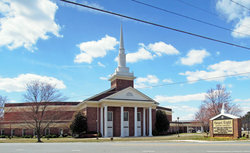 GLCS is a ministry of Gospel Light Baptist Church.